Celebrity Millennium offers premium luxury to its passengers with a 'Rooftop Terrace' where guests can relax and watch the sunset, a 'Solarium' area for everyone to enjoy as well as much more. 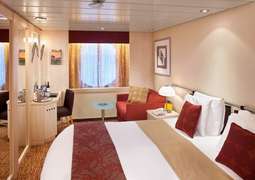 Celebrity Millennium is part of the Millennium class for Celebrity Cruises. 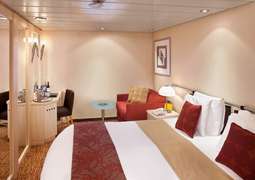 The ships premium service caters to all people, families and couples. Cruising around Asia and Alaska the views will not disappoint along with the beautiful blue seas. Sister ship with Celebrity Constellation, Celebrity Infinity and Celebrity Summit these ships will never dissatisfy you. Let yourself indulge in 'A Taste of Film' where you can enjoy watching acclaimed films while eating cuisine inspired by the film. Celebrity Millennium offers a range of food and restaurants to satisfy your every need. Why not enjoy the evening sunset on the 'Rooftop Terrace' where you can kick back and enjoy a cocktail or two. The activities onboard are endless! For those of you who are athletically inclined you can spend hours in 'Revive' or enjoy the dance classes on offer, while those who like challenge can have a go at the Trivia contests. Fun for the whole family at the Lawn Club where you can relax and enjoy lawn games. For those of you who are high tech, keep in touch 24 hours a day with the celebrity 'iLounge'. 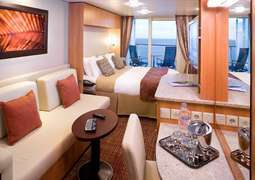 All cabins aboard the Celebrity Millennium are designed to 5-star standards, with spacious and comfortably furnished interiors. All cabins have a cosy sitting area, internet and an interactive television used for everything from video games and booking land excursions to ordering room service and films. 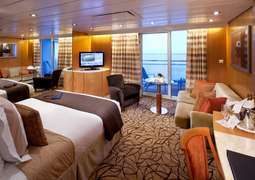 Drinks and meals can also be ordered without surcharge directly from your cabin at any time, day or night, while the more upscale cabins and suites provide an outstanding butler service. On board the Celebrity Millennium you can enjoy full board at its finest. For example, dine in the 2-story main restaurant while enjoying the incredible ocean view through floor-length windows, or feast in a specialty restaurant, where master chefs complete, carve and flambé delicious dishes directly at your table. Different cafés and a tea house provide a wonderful selection of teas, coffee specialties, baked goods and pralines. Boredom is the only thing you won't find aboard this luxury ship, whether you want to dance into the night or unwind in peace. The elegant piano music in Michael's Piano Club, discos and Broadway-style shows provide entertainment for all tastes. The 2-story library is complete with an extensive music collection with everything from beloved classical pieces to today's hottest hits, the perfect way to relax in your own style. There is a rich variety of luxurious wellness treatments in the spa on board, as well as a chance to enjoy a relaxing swim in the serenity of the pool. A Thalasso pool of sea water enriched with mineral extracts is also available for the ultimate rejuvenatory experience. The superbly equipped fitness area is perfect to keep your heart pumping, with superb sea views and a range of invigorating classes such as aerobics and pilates. For a journey on the Celebrity Millennium, casual and sporty clothing is recommended during the day, whereas elegant evening wear is recommended for the evenings. However, all who prefer to dine more casually in the evening are more than welcome to do so in the laid-back atmosphere of a self-serve restaurant. All persons under the age of 18 are considered minors when travelling with Royal Caribbean cruises. Both minors and young adults (between the ages of 18 and 21) are required to travel with an adult supervisor.